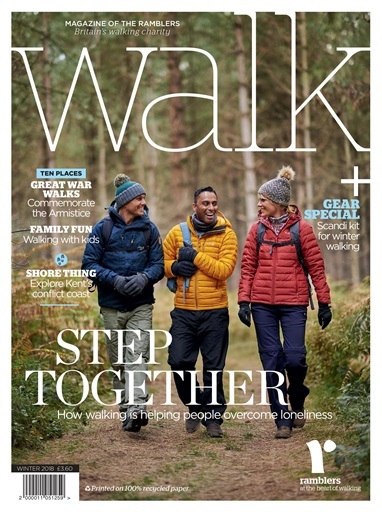 (0 Customer Reviews) | Write Review 4 issues per year Walk is Britain’s biggest walking magazine aimed at anyone who enjoys the outdoors on foot: from weekend strollers to expert mountaineers. Inside every edition you’ll find lavishly photographed features of the best walks across the UK and abroad, reviews of the latest outdoor gear, interviews with the biggest names from the outdoors world, expert tips and advice, OS-mapped route cards and beautifully illustrated field guides to help make the most of your trips. And just to prove we know what we’re talking about, we’re also the flagship publication of the Ramblers, so we’ve got the most knowledgeable and enthusiastic walkers in the country to impress every quarter. We hope you enjoy it as much as they do! In this edition of walk, we celebrate the social side of walking. 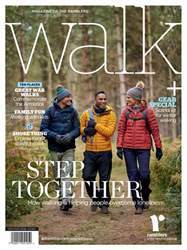 With Britain facing a loneliness epidemic and experts warning that isolation could be as harmful as smoking, we look at whether walking could provide the cure (p36). It’s accessible, aff­ordable and has so many wellbeing benefits – no wonder GPs are starting to prescribe walking instead of medication for some patients. Walking isn’t just great for physical health and companionship, but mental health, too. When Jake Tyler had depression, he found a daily walk helped. Keen to spread the word about the benefits of fresh air and exercise, he set off­ on a walk around Britain. in our This Season on Foot special (p10). Enjoy your winter walks – and the cosy fi reside chats and warming drinks afterwards! You'll receive 4 issues during a 1 year Walk magazine subscription. You'll receive 4 issues during a 1 year Walk magazine print subscription.